Our Conen Mounts electrically height-adjustable TV stand & monitor stands for heavy displays with TV cabinet can be easily adjusted in height. The base cabinet offers enough space for documents and other important utensils for your presentation! It has 4 self-closing, smooth drawers for plenty of storage space. Another advantage of this monitor & TV stand is the absolute freedom from maintenance - the monitor support never has to be adjusted, never lubricated or readjusted. Above all, the Conen Mounts TV cabinets with base cabinet are also designed for security. The entire weight of the TV stand does not hang on the wall as with conventional solutions, but is transferred to the floor via the aluminum column. The strong base plate, which is hidden in the base cabinet, provides additional stability. 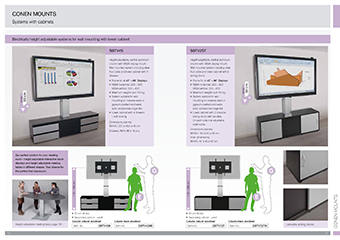 Our perfect solution for your meeting room – height adjustable interactive touch screen displays and height adjustable meeting tables in different shapes. Your chance for the perfect first impression.